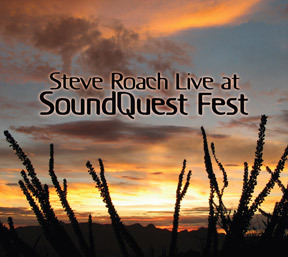 Steve’s pinnacle performance from 2010’s SoundQuest Fest proved to be a real moment in time, and fortunately it was documented with a high resolution recording that places the listener front and center. Presented as a chronicle of the first 74 minutes of the concert as it unfolded, three distinct realms are seamlessly mapped out on this CD. The opening starts with a 25-minute all electronic piece of perpetual forward motion. From here we experience an amazing interplay between didgeridoo players Dashmesh Khalsa, Brian Parnham, percussionist Byron Metcalf and Steve performing real-time looping, processing and mixing along with soundworlds, ocarina and voice. This passage is an all-out expression of shamanic ecstasy that boils over into an engulfing tribal trance state. The last portion of the set settles into an ultra drifting electro-organic zone that encapsulates many of Steve’s recent innovations and presents them in the dynamic light of the live setting. I’m pairing these reviews together because they more or less stem from the same creative space. Erik Wøllo came to Tucson, Arizona, as part of Steve Roach’s SoundQuest Fest 2011. He played his superb piece, The Gateway, live during the show. Afterward, Wøllo and Roach seized upon the creative momentum that came out of the concert and spent the next few days at Roach’s Timeroom studio finishing up work they had started earlier in the year, which would become The Road Eternal. It’s not easy for me to be objective about Live at SoundQuest Fest because I was there, and it was something of a defining moment for me as an ambient music fan. I’ve been into Roach’s music since the 80s and am particularly appreciative of his tribal work. I was out in the desert for the first time. And I was among a gathering of my electro-tribe, meeting many of the people whose music I’ve come to appreciate over the years. So listening to this slice of Roach’s day-closing set carries a lot of connotations for me. The work here lands squarely in future-primitive space, intertwining rapid-fire analog/sequencer foundations and long, drifting pads with deep, shamanic excursions. It kicks off with the nearly 30-minute “Momentum of Desire,” beginning with Roach working his synths solo, shifting from beatless washes to pulsing energy. The mood transforms as Byron Metcalf enters to bring a bit of tribal juju with shakers, rattles and drums at the start of “Medicine of the Moment,” and we leave the present behind. This is the start of a 25-minute long deep shamanic groove that runs through the fiery “Thunderwalkers.” As Roach and Metcalf prepare the space, didgeridoo players Dashmesh Khalsa and Brian Parnham enter, each taking up a six-foot stick, to trade otherworldly tones and pour them into the proceedings. The feeling takes on a sacred air as the quartet craft a largely improvised, live-looped atmosphere that’s all about instinct and existing in the energy of the moment. Musical intent is left behind in lieu of crafting a response-driven sound-image. It wraps around you. Roach’s ocarina slithers through; the didgeridoos bark, snarl and cajole; shadowy drones lay over everything, As the set moves into “Thunderwalkers,” Metcalf’s rhythms crack the darkness and energize the space with a living pulse. Power absolutely courses through every moment of this track. I love the chant sounds around the 7 minute mark–it’s Roach leaning into the mic with a “yyyah,” the single voice processed into a tribal call. Khalsa leads the way through the short, transformational track “Morphic” with more growling and yelping didge, the sounds intensified and thickened by Roach at the soundboard. Then it’s left to Roach to cool down the moment and bring it back toward the now with the pure synth work of “Off Planet Passage.” Echoes of Metcalf’s skins anchor the sound as it winds toward a quiet close. Aside from capturing the energy of this superb grouping, Live at SoundQuest Fest also benefits from the way it carries reminders and hints of work past and future. The tribal sections call up thoughts of Dream Tracker, The Desert Inbetween and Serpent’s Lair–while also hinting at that disc’s upcoming follow-up; the analog work pulls from the energetic sources that inform and infuse so much of Roach’s recent solo work, including Immersion 5, which pulls from “Off Planet Passage.” An excellent record of a fantastic event. If SoundQuest pulls the listener down into primal-memory introspection, The Road Eternal lifts them into a more optimistic and upbeat state of mind. The energy of rhythmic sequencers kicks in right away, a liquid shimmer that gleams across most of the tracks. Wøllo’s guitar hums and sings its way through the mix in an easy lilt that plays neatly off the geometries of the sequencer runs. (It’s at its finest in the cool coursings of “The Next Place” or softly sighing as the voice in “Night Strands.”) This is a work about velocity and movement, about going forward. Unlike the duo’s previous effort, Stream of Thought, which existed a moment at a time, The Road Eternal sets its focus squarely on the horizon and heads for it. But it’s not all pedal-to-the-metal. After revving the engine with the title track, “Depart At Sunrise” coasts into view, a panoramic vista opening slowly in front of you. The sequencers get dialed back a touch to make space for long pads and crunchy analog synth effects. “First Twilight” appropriately slows to a gentle ambient drift, Roach and Wøllo tinting their shared sky with lush aural colors fading into night. “Travel by Moonlight” eases the tempo back up, underscored by a rich, repeating bass pulse. Wøllo’s guitar soars as counterpoint. Roach notes on his site: “Listening to these tracks while traveling allows the music to merge with the experience arriving at an integrated place where thoughts and imagination are unified as a soundtrack for one’s own road movie.” I’ll attest to that. The Road Eternal has softened many a commute and provided the incidental music for thought-filled evening drives home. Listen, and see where the music takes you.